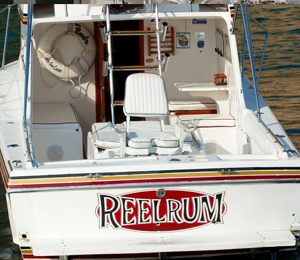 The ReelRum is part of one of Cabo San Lucas's most well-known and well-respected fleets. We are eager to let our guests join us on the ReelRum for a day of fishing like no other! The ReelRum is a 28-foot Californian fishing boat that comes complete with single-engine inboard Cummins, one fighting chair, an on-board bathroom and can hold up to 4 lucky guests. This is luxury at its finest and at its most affordable! When you reserve the ReelRum for your Cabo fishing day, you are reserving with one of the area’s most experienced fishing teams. The fishing guides and captain on your private charter have been fishing the waters of the Los Cabos areas for decades. These guides know these waters better than anyone. And they are ready to show you what all the fuss is about in Cabo San Lucas. The deep waters surrounding Cabo are home to a wide array of sport fish including marlin, sailfish, snapper, wahoo, tuna, grouper, mahi, and so much more. Most of these species you can even take home with you or get grilled up at your favorite local restaurant! Booking your private Cabo fishing charter is easy! We do suggest, however, booking it as far in advance as possible, especially the ReelRum. The ReelRum is one of the smaller boats in the fleet and is usually one of the first to go thanks to the unbelievably low price. The price comes complete with all your fishing gear, bait and tackle, a sandwich lunch with snacks, water bottles, and a cooler filled with ice. Yes, our crews are bilingual. Sometimes you need to coax it out of them, but they will do their best. Think about learning English as a second language and one day you have a family from the Bayou’s of Louisiana on board and the next day you have four guys from Dublin, Ireland. You don't need to speak any louder, but slowing it down a bit may help. I have been to the Bahamas many times, but ReelRum - 28' Californian is one of my favorite trips! It includes everything that everyone should do here. As a Bahamas veteran, I can say only the best about this experience!